Heartsaver CPR and AED is a classroom, video-based, instructor-led course from the American Heart Association that teaches students CPR and AED use, as well as how to relieve choking. This course teaches the AHA research-proven skills using the practice-while-watching technique. This technique allows the instructors to observe the students practical skills while being able to provide positive feedback and improve students' learning. AUDIENCE: This course is for anyone with limited or no formal medical training who needs a course completion card in CPR and AED in order to meet certain job, regulatory, or other requirements. This course DOES NOT teach FIRST AID. If you are needing First Aid certification, see our Heartsaver First Aid, CPR and AED course. 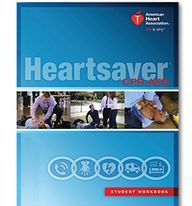 CERTIFICATION: Upon completion of this course, students receive an American Heart Association Heartsaver CPR AED Course completion card that is valid for two years.